McCroskey Law mourns the loss of its former partner and president, Darryl Cochrane, born on October 26, 1939 in Alpena Michigan, who died June 11, 2013 in Muskegon. His father was a barber. His mother was a constant source of support, encouraging Darryl to use his many talents constructively. And he did just that. Darryl was a gifted student at Alpena Community College, and at The University of Michigan where he received a Bachelor’s Degree, a Masters in Business Administration, and his law degree. He was always near the top of his class, a hard-working and aggressive student. It was during his second summer of law school, that Darryl took a job that would set his course as an attorney. He worked at McCroskey Law with one of its founders, Jerry McCroskey, a dedicated and brilliant labor lawyer. Upon graduation Darryl came back to Muskegon and worked under Jerry’s tutelage. 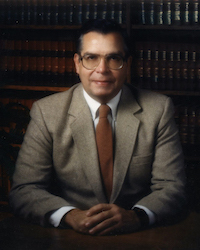 Eventually Darryl became West Michigan’s premier labor lawyer, taking over the firm’s labor union clients when Jerry was killed in an auto collision in the fall of 1974. Deeply committed to the labor movement and the Democratic Party, Darryl was a formidable opponent, whether in the courtroom or across the negotiating table. His understanding of businesses and balance sheets made it hard for employers to hoodwink the unions during negotiations. He was at the same time aggressive, yet gentle, in court. Professional honors and recognitions were plentiful during a long career. Darryl served as president of his firm, was honored as one of the Best Lawyers in America for many years, and distinguished himself representing the working men and women of this State. Perhaps more importantly, Darryl was honest to everyone he met and loyal to his clients and law partners. He was a good man and will be sorely missed. We serve the following localities: Berrien County including Benton Harbor, Berrien Springs, Niles, and St. Joseph; Calhoun County including Albion, Battle Creek, and Marshall; Jackson County including Jackson; Kalamazoo County including Kalamazoo and Portage; Kent County including Comstock Park, Cutlerville, Forest Hills, Grand Rapids, Kentwood, and Wyoming; Mason County including Ludington; Mecosta County including Big Rapids; Muskegon County including Muskegon; and Ottawa County including Holland and Grand Haven.